Chao also announced that DOT plans to publish an Advance Notice of Proposed Rulemaking that aims to identify major drone safety and security issues. The proposal will ask for recommendations on issues that may pose a threat to other aircraft, people or national security. The department also has selected three commercial service entities to develop technology to provide flight planning, communication and weather services for these drones. “Taken together, these three initiatives will be a major step forward in enabling the safe development and testing of drones in this country,” Chao said. DOT as a whole has demonstrated a focus on various autonomous technologies, including vehicles. 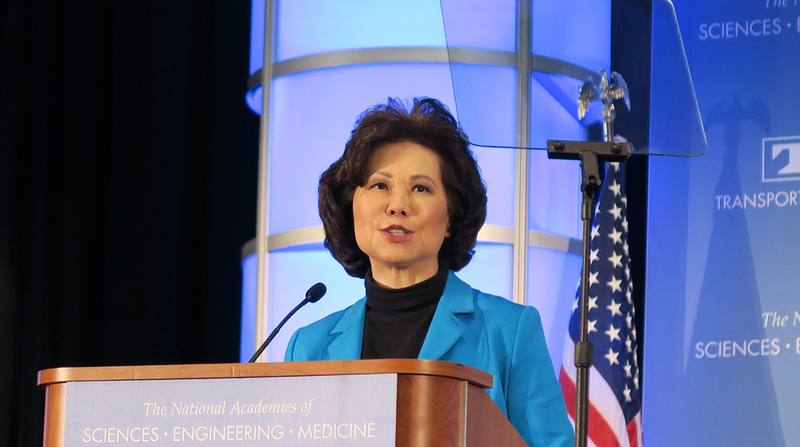 Specifically, Chao mentioned two of the agency’s relatively recent documents — Automated Driving Systems: A Vision for Safety 2.0 and AV 3.0, the agency’s policy update of autonomous-vehicle technology guidelines. Chao said these documents, each of which provides a framework for people developing and adopting such technologies, would not be possible without engagement from industry representatives. Autonomous technology can take a variety of forms in transportation, from lane-departure warning systems and automated brakes to truck platooning. Automated technologies have, however, raised public concern over security and privacy. Chao in the past has reported that nearly three-fourths of American drivers have expressed fear and anxiety about riding in a self-driving vehicle. Chao urged manufacturers and Silicon Valley technology leaders to help educate consumers in an effort to dispel apprehensions. Chao’s appearance occurred on the 24th day of the federal government shutdown, which began Dec. 22. Chao had canceled her speaking engagement at CES, the annual electronics trade show in Las Vegas, that was scheduled just a few days before TRB’s meeting.